Pre-Lenten Greetings in the name of our Lord and Savior Jesus Christ. We have just come from a successful Winter Conference for Clergy and Deaconesses held at All Saints’ Anglican Church, Palatka, Florida. All Saints’ Church also celebrated their 40th anniversary of founding on the Sunday after the Conference. I had the pleasure of preaching and celebrating this special occasion. Many thanks to Father Frank Bartlett and Senior Warden Greg Garris for their efforts in coordinating the events and meals for the Clergy Conference. We were privileged to have two of our outstanding priests conduct morning and afternoon developmental sessions at the Conference. On Thursday morning, Father Paul Rivard, Rector of St. George’s Church, Simpsonville, South Carolina, did a session on the subject of “Higher Criticism” of the Scripture and how it impacts orthodox Christianity, especially the Continuing Anglican Church. Although not usually an exciting subject, it is important, and Fr. Rivard made his presentation come alive and interactive. Our afternoon session was conducted by Father Mark Menees, Rector of St. John’s Church, Greensboro, North Carolina, on hermeneutics and critical reading of the scriptures in preparation for teaching and preaching. Both sessions were very well received. We were pleased to be joined at the Conference by Anglican Catholic Church (ACC) Archbishop Mark Haverland and, representing the APA, Diocese of the West, Father Ian Emile Dunn, all the way from All Saints’ Church, Prescott, AZ. As I write, we are entering the Pre-Lenten and Lenten season of our Church Year. It always seems that Lent comes very quickly following Christmastide. As a result, we often do not have adequate time to think and plan how we are going to use Lent profitably for our spiritual development. The busyness of life so often overwhelms us and we lose track of our priorities. The Church provides a Pre-Lenten period and I encourage you to use this time to decide on how you are going to use abstinence and fasting along with positive activities of putting your Christian Faith into action during the Lenten Season. For example, if you have fallen out of the habit of doing the Morning and Evening Prayer Office, this Pre-Lenten period is a good time to re-establish this practice in your life. Perhaps you have neglected your regular presence at the Sacrament or being in the Church for a week day Eucharist, Stations of the Cross and Bible Study. Make this a time of establishing patterns of living that will carry over into the remainder of the Calendar year. Think of Pre-Lent as a time in your life to make a plan on how you will use the Lenten Season profitably to your spiritual grown and health. I have designated our Lenten Appeal for 2018 to be the building of our second school in the Kadapa District of Andhra Pradesh near the Town of Jammalamadugu, South India close to Bishop Jaya Rao’s Cathedral. This will be a joint project with OM and will benefit the needy children in our churches in the area. We will send out the Appeal Letter to our churches this week and remember the people and the children where we minister are Dalit (outcastes). These children are those who have the least possibility, without an education, to have a life other than working in the fields cleaning sewers or begging. Please make this a critical part of your Lenten discipline as you contribute to this worthy cause in Building God’s Kingdom among our brethren in South India. The Diocese of the Eastern U.S. (DEUS) will be meeting for Synod the week of July 16-20, 2018, hosted by St. Michael the Archangel Anglican Church, in Matthews (Charlotte) N. C. This will be the 50th anniversary of the DEUS and special events are planned. The Meetings will be held at the Hilton Charlotte University Place. Deaconess Tina Jenkins is the Synod Coordinator and Father Michael Cawthon is the Rector. More information will be forthcoming, so please put the dates on your calendar. The Diocese of Mid-America will be meeting for Synod in San Antonio, Texas at their newest church, St. Chad’s Anglican Church, where Bishop Giffin is the Rector. Bishop Robert Giffin has announced the dates of the Synod will be July 26-27, 2018. They have a lot planned for the Synod, including a visit to historic sites. The Diocese of the West (DOW) has not yet announced the specific date of their Synod but it will be hosted in the Fall by St. Michael’s Anglican Church in Wilsonville (Portland) Oregon. Canon Robert Hawkins is the Rector of St. Michael’s and Vicar General of the DOW. Further information on each of these Synods will be announced later on our APA website. As we enter into the new calendar year, we are in uncharted territory once again. New challenges will come our way and often hit us unexpectedly. Some of the challenges will cause those of us who are clergy to doubt our vocation. Death, sickness, family problems, parish issues that seem insolvable may conspire to make us think we have been abandoned. The Satanic forces will stop at nothing to destroy our growing ministries. Remember when these attacks come, “…because greater is he that is in you than he that is in the world.” (I John 4:4) May we pray that God through his Holy Spirit will continue to strengthen us and give us courage to face the challenges confronting us. It is important to develop a relationship with some trusted priest to share with one another the challenges being faced for consultation and prayer. The important thing is to not let the adversary have the victory. For all of us, remember to keep one another in daily prayer. I call your attention to the publication entitled The Trinitarian, the official gazette of the Anglican Catholic Church, one of our G-4 intercommunion partners. This magazine has been published for many years by Editor John Omwake. The last issue contained two major articles on Anglican Province of America parishes. The Trinitarian is the only media (print and digital) that reports news from all G-4 jurisdictions. This publication presents a positive image of Traditional Anglicans. Those who are familiar with The Trinitarian are well aware of its quality. I personally encourage every parish to subscribe in a bulk quantity for distribution to membership and as an evangelist tool. Rates are $22/year, digital only; $25/year print only; and $28/year print and digital. Payment should be sent to 6413 South Elati St, Littleton, CO, 80210. Please include USPS mail address and, if subscribing to the digital edition, a current email address. For more on bundle subscriptions, email trinitarian2010@gmail.com. We are thankful that Fr. Gordon Anderson has agreed to be our new Editor for the Ecclesia Anglicana publication. Please submit news-worthy articles from your parishes to Fr. Anderson (jgordon.anderson@gmail.com). As most of you have heard, Father Frank O’Donnell passed from the Church Militant to the Church Expectant on Sunday, January 28, following his celebration of the Eucharist. Please pray for the sweet repose of our brother and fellow priest, along with prayers for his wife Beverly, and congregation of St. Timothy’s Church, Swannanoa, North Carolina. Bishop Clark Dorman is entering Hospice care. Please keep him and his wife Peg in your prayers for strength and comfort. Your prayers are requested for retired Bishop Ray Hanlan and his wife Joan. Bishop Hanlan is in need of two hip replacements and a knee replacement. Because both of their failing health, they are in debt. They will be posting a “Go Fund Me” page to appeal for help for their mounting medical bills. I pray that all will do whatever they can to help them. Please pray for Father Kevin Sweeney who is back in the hospital for surgery following a relapse in his health. When I organized a APA Domestic Mission Fund Program several years ago, I appointed Bishop Bill Perkins to serve as Chairman. I have changed his title from Chairman to Bishop of Domestic Missions Programs. Please join me in giving Praise and Glory to God for his abundant blessings and growth of our Province. On November 26, 2017, the Rev. Canon Robert W. Hawkins, Vicar General, DOW, installed the Rev. Father Christopher Smith as Rector of St. Andrew’s Anglican Church, Jacksonville, Oregon. Mr. Andrew Staley, Senior Warden, presented the keys of the church to the new Rector, and the service ended to the strains of “Scotland the Brave” provided by a local bagpiper in celebration of the institution and the Feast of St. Andrew. Fr. Smith will be assisted by Fr. Bill Baker, who has begun preliminary planning for a new church plant in the southern Oregon region. On December 9, 2017, the Rt. Rev. Robert Todd Giffin instituted the Rev. 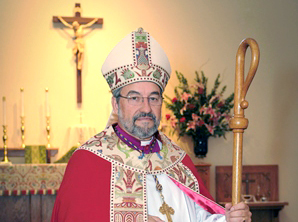 Ian Emile Dunn as Rector of All Saints Anglican Church in Prescott, Arizona. The Rev. Canon Robert Hawkins and the Rev. Yossi Sarid were also in attendance. Fr. Dunn joins All Saints Anglican Church after having served APA and ACA parishes in North Carolina, California, and Maine. He and the members of the church are excited to be entering this new season for the church. The parish and visitors enjoyed a joyful weekend of worship and fellowship. As Required by APA Canon 43, all churches in the Province need to turn in their annual Parochial Reports (Jan. 1-Dec. 31, 2017) to their Bishop Ordinary. Deadline is March 1. There is a new way to submit forms this year. All forms must be submitted online. The online format is similar to the type used for Clergy Conference Registration with quick question and answer entry. The online form is on the APA website (click here). The online form will automatically send the parish data to the APA office and send a copy to the church email address used for submission. For DMA parishes, data will be forwarded to the Rt. Rev. Robert Giffin, Bishop Ordinary and for DOW parishes, with the Rev. Canon Hawkins, Vicar General. This is a reminder to all non-parochial clergy that you are required to send your Diocesan Bishop (or Vicar General for DOW) a letter at least once a year. Advent Season is preferred so if you haven’t done so already, please send your letters before or during Lent. This will satisfy Canon 43, Section 1 of the APA Canons which reads in part: “And every Minister not in charge of any Parish or Congregation shall also report his occasional services, and if there have been none, the causes or reasons which have prevented the same.” Please send me a letter or email during this Lenten Season. (Assistants and Curates are exempt because the Annual report from the Rector/Vicar includes all his subordinate clergy). I would enjoy and appreciate hearing from you. Unfortunately, those who fail to contact me will ultimately be dropped from the APA roles. DEUS: Mr. Robert Shoup was ordained to the Diaconate on November 11, 2017, at St. Patrick’s Church, Brevard, NC. Deacon Shoup will also serve as Deacon at St. Patrick’s Church. DEUS: The Rev. Mr. Daniel Rieger was ordained to the Sacred Order of Priest on November 25, 2017, at St. Mary the Virgin Church, Delray Beach, Florida. He will continue to serve as the Curate at St. Mary the Virgin Church. DEUS: The Rev. Mr. Sean McDermott will be ordained to the Sacred Order of Priest on February 24, at All Saints’ Church, Charlottesville, VA. Fr. McDermott will serve as Curate at All Saints’ Church. DEUS: The Rev. Mr. Peter Joslyn will be ordained to the Sacred Order of Priest on March 18, at St. John’s Church, Greensboro, NC. Fr. Joslyn will serve as Assisting Priest at St. John’s Church. DEUS: Mr. Carlton Bridgewater will be ordained to the Diaconate on April 21, 2018, at St. Alban’s, Cathedral, Oviedo, Florida. He will serve as Deacon at St. Alban’s Cathedral. DEUS: Mr. Thomas Houghton will be ordained to the Diaconate on April 28, 2018, at St. Paul’s Church, Crownsville, Maryland. He will serve as Deacon at St. Paul’s Church. DEUS: The Rev. Mr. Tyler Phass accepted an assignment as Deacon at St. Paul’s Church, Melbourne, Florida. DEUS: The Rev. Lawrence Adams has transferred to the Anglican Church in North America to continue his work in Uganda. DOW: The Rev. Christopher Smith was installed as Rector of St. Andrew’s Church, Jacksonville, Oregon, by Vicar General, The Rev. Canon Robert Hawkins, AZ, on November 26, 2017. DOW: The Rev. Ian Dunn was installed as Rector of All Saints Church, Prescott, AZ, by Episcopal Visitor, the Rt. Rev. Robert Giffin on December 9, 2017. St. Philip’s Church, Pinellas Park, FL. Bishop Dorman and Peg, Bishop Hanlan and wife, Joan; Fr. Sweeney; Deacon Al Ryan’s wife, Claudia; Bishop Shaver, Fr. Conway, Fr. Carter; Fr. Bakley; Fr. Gardner. RIP: The Rev. Frank O’Donnell. Jan. 6: Meeting with Benedictine Brothers Ned and Kurt Gerber of Forward in Faith, Australasia, concerning their mission and ministry and how it relates to the latest efforts they have working with Anglican Churches, Oviedo, Florida. Jan. 23-26: APA Winter Clergy Conference (Clergy Wives and Deaconesses), All Saints’ Church, Palatka, Florida. Jan. 26: DEUS Standing Committee Meeting at All Saints’ Church, Palatka, Florida. Jan. 28: Visitation to celebrate church’s 40th year of founding, All Saints’ Church, Palatka, Florida. Feb. 9-11: Episcopal Visitation, planning for future along with Vestry, Sunday Congregational Meeting and luncheon, Holy Cross, Church, Farragut (Knoxville), Tennessee. Feb. 13: Archbishop Conference Call of G-4. Feb. 14: Celebrate Ash Wednesday Noon Office, Imposition of Ashes and Mass, St. Alban’s Cathedral, Florida. Feb. 18: Episcopal Visitation, St. Luke’s Church, Port Orange, Florida. Feb. 23-25: Ordination of Deacon Sean McDermott to the Sacred Priesthood, Confirmation and Receptions, All Saints’ Church, Charlottesville, Virginia. Mar. 3: Requiem for Father Frank O’Donnell at Matthew’s Church, Weaverville, North Carolina. Mar. 4: Confirmations and Blessing of new interior, St. George’s Anglican Church, Simpsonville (Greenville/Spartanburg), South Carolina. Mar. 10:11: Episcopal Visitation, All Saints’ Church, Wilmington, North Carolina. Mar. 17-18: Ordination of Deacon Peter Joslyn to the Sacred Order of Priest; Confirmation and Receptions, St. John’s Church, Greensboro, North Carolina. Mar. 25-Apr. 1: Holy Week and Easter at St. Alban’s Cathedral, Oviedo (Orlando), Florida. Mar. 24: Accompanying Dr. Mary Grundorf for an India Presentation to the Women of the Church at St. Paul’s, Melbourne with St. Mark’s, Vero Beach, and ACC Women of the Church in Palm Bay, Florida. Apr. 28: Ordination of Mr. Thomas Hougton to the Diaconate, St. Paul’s Church, Crownsville, Maryland. Jan. 14: Episcopal Visitation and Confirmations, St. Francis of Assisi Church, Jonesboro, Georgia. Jan. 23-26: Diocesan Board of Examining Chaplains meeting; Diocesan Standing Committee meeting; APA Winter Clergy Conference, All Saints’ Church, Palatka, Florida. Feb. 11: Episcopal Visitation and Blessing of New Window, Christ the Redeemer Church, Warner Robins, Georgia. Feb. 24: Retreat Conductor for the Lenten Quiet Day, Saint Stephen’s Cathedral (ACC), Athens, Georgia. Mar. 20-22: Retreat Conductor for the Clericus Retreat of the Diocese of the Holy Cross, Monastery of the Holy Spirit, Conyers, Georgia. Apr. 15: Episcopal Visitation, All Souls’ Church, Asheboro, North Carolina. Jan. 9: S. Florida Traditional Anglican Clericus, Boca Raton, Florida. Jan. 25: APA Winter Clergy Conference, All Saints Church, Palatka, Florida. Jan. 26: DEUS Standing Committee meeting, All Saints Church Palatka, Florida. Jan. 30: Attendance of the Feast of St. Charles the Martyr service, Holy Guardian Angels Church (ACC), Lantana, Florida. Feb. 13: S. Florida Traditional Anglican Clericus, Boca Raton, Florida. Feb. 25: Preacher, The Cathedral Church of the Resurrection (CEC), Miramar, Florida. Mar. 13: S. Florida Traditional Anglican Clericus Boca Raton, Florida. Mea Culpa—In the last edition the anniversary of Rev. Benjamin Holland’s ordination to priesthood was omitted (October 18). Blessings to Fr. Holland. Please contact the APA Office at 80.480.1087 or at apadeus@cfl.rr.com if any of dates are in error or a date has been omitted.